In addition to the 50-metre long swimming pool loved by swimming fans the renewed open-air bath offers 5 more brand new pools for visitors. SWIMMING POOL: In addition to serving our guests, the swimming pool hosts swimming and water-polo trainings, under-18 group therapeutic swimming and swimming classes for elementary schools both in summer and winter. Outside the open-air season the pool is covered with an air-supported tent assuring a suitable environment for swimming and water sports all the year round. RECREATIONAL POOL: where several massaging water jets, neck showers, underwater massaging water jets help you relax with thoroughly massaging areas of the back, shoulders or waist. The recreational pool is open to the public all throughout the year. SITTING POOL: where bubble beds, bubble benches and standing bubble baths assure a most pleasant spa experience. POOL WITH WATER SLIDES: exhilarating experience for adrenalin addicts in a system consisting of 3 slides. a family slide, a Kamikaze slide, and an anaconda slide offer endless joy to adventurous children and adults alike. Starting height: 9 m and 12 m.
EDUCATIONAL and PE POOL: highly suitable for people who are not confident swimmers or for those who would like to take part in free water aerobic shows on hot summer days or regular water aerobic trainings. 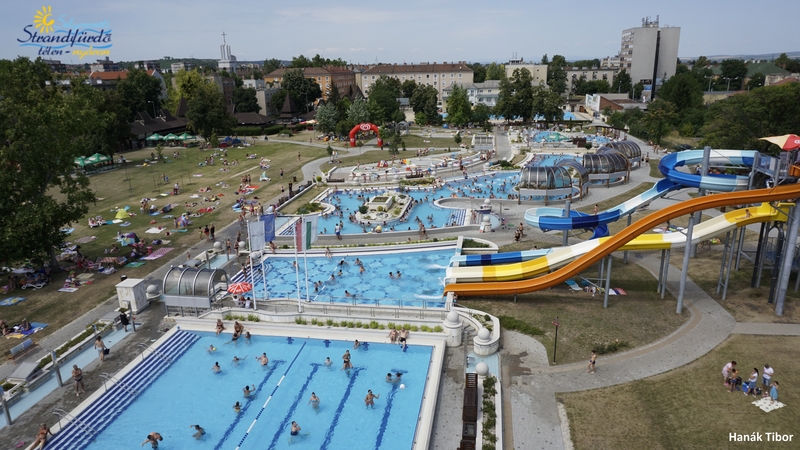 CHILDREN’S POOL: excellent enjoyment for the youngest is guaranteed by attractions like the water castle with a winding mini slide, a water cannon, water drips and umbrella features.